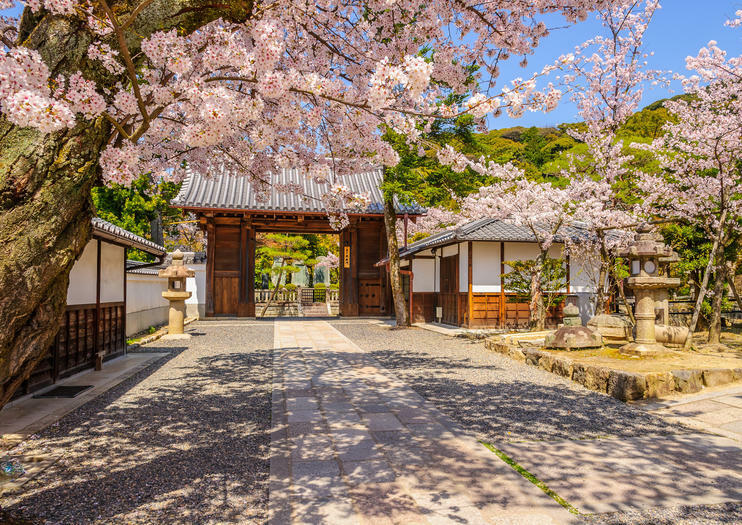 Cherry blossom season is an annual event in Japan, a time when photographers and sightseers flock to Kyoto to marvel at city’s historic temples surrounded by pink flowers. Here are some ways to maximize your visit during this special annual period. The peak of cherry blossom (also called hanami) season usually happens between the last week of March and the first two weeks of April, with the peak period of blooms occurring around April 1. However, the specific time for this annual event depends on the current year’s weather conditions. Make sure to leave some flexibility in your travel plans to have the best chance of success. Although the cherry trees will bloom throughout this UNESCO-listed city, a number of blossom spots have grown in popularity thanks to their combination of location and scenic beauty. Many blossom tourists head for the Imperial Palace, which offers great views of the palace complex alongside the pink blooms. The “Philosopher’s Path,” which offers a walkway alongside a canal linking Nanzenji and Kinkakuji Temples, is another great option. The urban street of Shimbashi is another highly-rated cherry blossom area. Many visitors choose to experience the cherry-blossom bloom on two feet. But for anyone looking to maximize their sightseeing time during this special period, tours by bicycle or rickshaw are also great options. The addition of wheels allows guests to cover more ground and avoid the crowds during the the busy viewing season. Experience the top cultural highlights in the ancient city of Kyoto during this half-day tour departing by train from Osaka. Head out with a local guide to explore 2 UNESCO World Heritage-listed sites, including Nijo Castle and Kinkaku-Ji (also known as the Golden Pavilion). Spend additional time visiting Kyoto’s regal Imperial Palace before browsing for authentic souvenirs at the Kyoto Handicraft Center. This guided excursion of Kyoto includes pickup from select hotels in Osaka, round-trip JR rail ticket from Osaka to Kyoto, and all admission fees.